Here’s the finished piece for the BirdZeed January Challenge. “Line” was the inspiration word. For this piece, I began by thinking of phrases about lines: “Walk the Line,” “Tow the Line,” and “Line in the Sand,” which is the one that Robyn mentioned in her blog post about the Alamo in San Antonio. 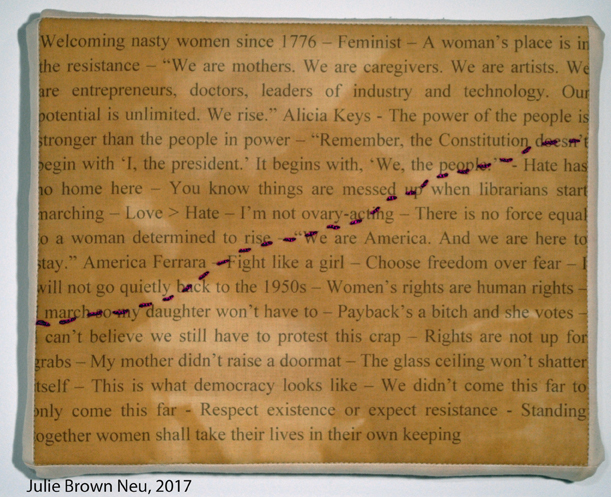 “Line in the Sand” made me think about the recent Women’s Marches, thus I made this piece with lines of text from speeches and signs at the marches, crossed by a pink “line in the sand.” The piece is dyed in tea, so that it wasn’t the bright white of the original fabric, but also because as a resident of Boston, tea is a symbol of protest, of revolution, of political action. “His name is Donald Trump,” our daughter piped in from the back seat. “And Mommy doesn’t like him. I know because she was sad that day on the beach.” We were on vacation with friends the week of the election in a Grand Cayman paradise. The morning after the election, I took my cup of tea outside and sat on the beach, looking over the water and crying. My daughter came out and asked me why I was sad. “How does one explain an election to a 4 year old?” I wondered, but I did my best and said, “Every four years we have what is called an election to decide who we all want to be the leader of this country. Everyone in the country (I did not get into the fact that that isn’t remotely true but decided to keep it simple) says which person they want to lead, the votes are all added up and the person with the most votes wins. (I didn’t get into the details of the Electoral College and how majority vote doesn’t really win either.) I am sad because I wanted Hillary Clinton to win but Donald Trump won instead.” That was a sufficient explanation for her and she gave me a hug and went back inside. I couldn’t really tell her that I was crying because, as a woman, I was deeply saddened and afraid because my fellow countrymen and women had voted for a misogynist who jokes about sexual assault. I couldn’t tell her about the deeply personal posts I had seen on Facebook from loved ones who had broken decades of silence about their own experiences with sexual assault to plead with people to not vote for such a human being. I couldn’t tell her that as the mother of a very young girl, I was deeply distraught about my ability to protect her, to keep her safe from the sexual predation that has been a lifelong fear of mine. I did not attend the Women’s March in Boston and I felt a little guilty about that, enough to question myself about why. The easy answer is that I don’t like crowds, but it wasn’t just that. I realized that I was still grieving over the election. I was still in denial on Inauguration Day and was not yet ready for action. I still may not be, but that does not mean I don’t feel very deeply troubled about our country and that’s what is in Line in the Sand. I stand with the women and men who marched, who wrote slogans and made speeches, and who said, “No. Enough. No more. This is our line in the sand.” The last slogan on the work is one I saw on a vintage suffragette banner; it serves as a reminder that this struggle is a long one and not yet won. I may not have marched (yet), but I stand together with those who did and with my foremothers before. Beautiful, Julie. I was there with you in Cayman, and am there with you now. The only silver lining of that morning on the beach was that we were not there alone. Continue to make art. Continue to tell our children that Right , not Might will prevail. Continue to have hope, and in doing so, you are making your life “that of your own keeping” and allowing our sons and daughters to follow in our footsteps the same.